A 23-year-old male patient who presented with history of fever and cough of 10-15 days duration expired after short hospital stay. A complete postmortem examination was done. Lungs showed features of confluent bronchopneumonia. 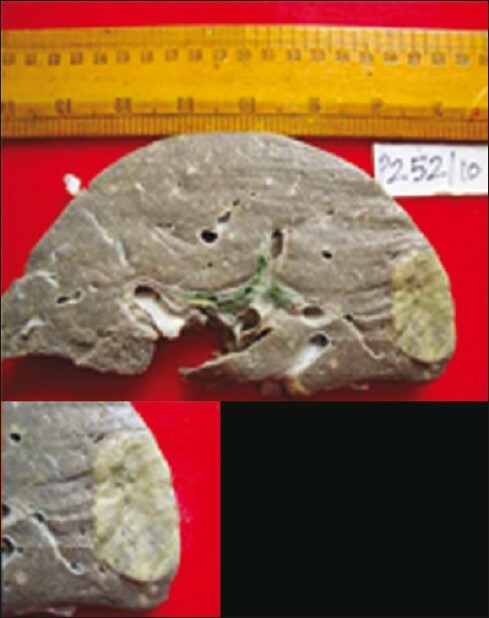 Liver weighed 1200 g. Right lobe of liver showed a nodular subcapsular lesion measuring 4 ×3×2 cm in size with central umbilication. On cut section the mass was solid pale yellow. No central scar was seen on naked eye examination [Figure 1]. Similar multiple tiny yellow nodules were seen throughout the entire liver parenchyma ranging from 1 to 2 cm. 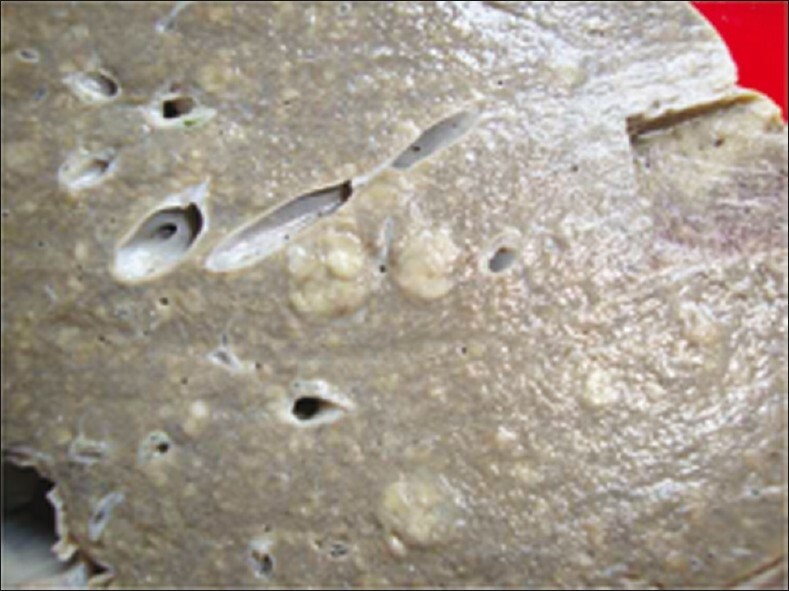 Nodules were slightly raised above the surface [Figure 2]. There was no evidence of necrosis or hemorrhage. Surrounding liver showed chronic venous congestion. Biliary system was unremarkable. No space-occupying lesions were seen in the other organs. Lymph nodes were not enlarged. On gross examination of liver possibility of infective etiology was considered. Since the patient died of bilateral bronchopneumonia we suspected these lesions to be multiple abscesses probably of bacterial or fungal etiology. Microscopical examination of the large nodule of the liver showed normal hepatocytes arranged in 2-3 cell plate thickness surrounded by fibrous septa. 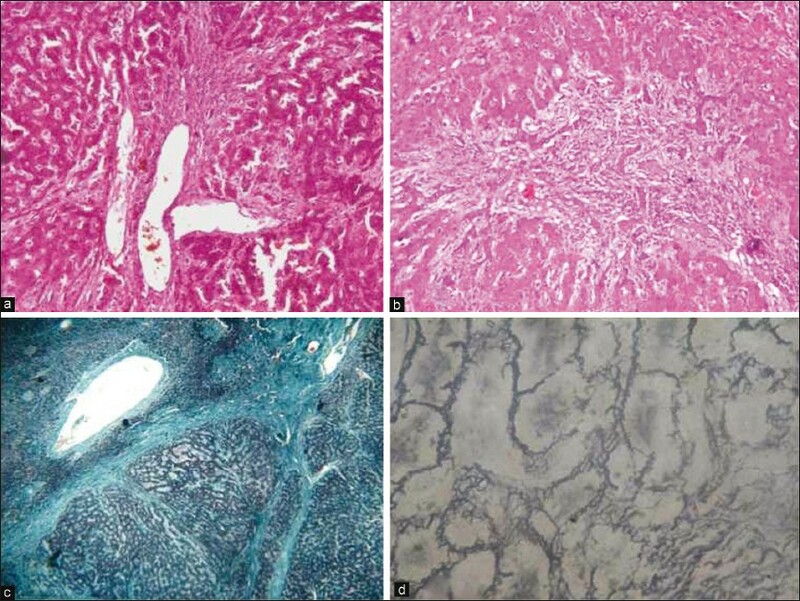 Central fibrous scars consisting of large dilated thick-walled blood vessels [Figure 3]a with proliferating bile ductules and moderate inflammation [Figure 3]b were appreciated only on microscopical examination). 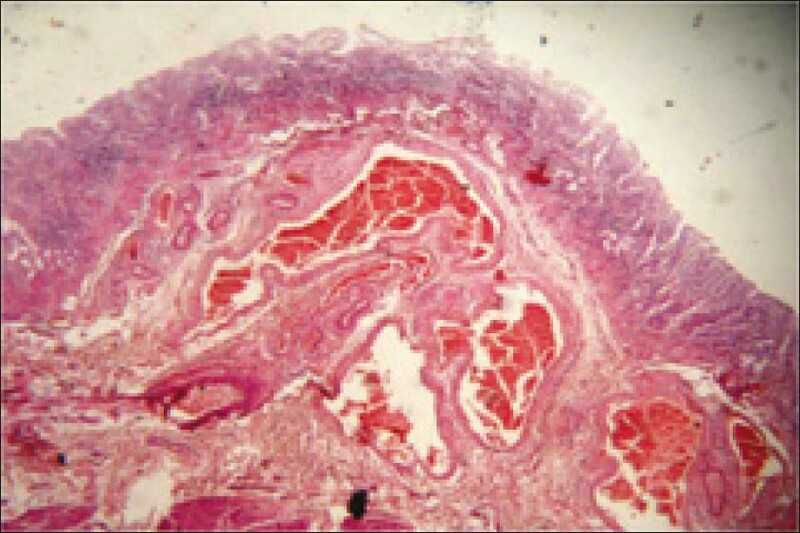 Massons Trichrome stain was done which highlighted the fibrous tissue around the liver nodule and the thickened blood vessels. Retic stain done on the liver demonstrated the two cell plate thickness of the hepatocytes [Figure 3]d. Few nodules showed presence of large ectatic blood vessels at the periphery of the nodule. Surrounding liver parenchyma showed changes of chronic venous congestion. There was no evidence of adenoma or hepatocellular carcinoma. Sections from the stomach showed large dilated cavernous type of vessels in the submucosa [Figure 4]. Seventy to ninety percent of the cases of FNH at presentation are asymptomatic and majority of them are diagnosed as an incidental finding on radiological investigation. , In the present case it was an incidental finding on autopsy. It is commonly seen in women between the age group of 20-40 yrs, primarily being associated with the use of oral contraceptives. In males cigarette smoking is a risk factor. However, deviations from these usual presentations can been seen as was seen in our case. In the present case the patient was a male and a nonsmoker. The pathogenesis of FNH is not clear. Wanless and colleagues after studying 36 cases and review of literature concluded that the lesion results from a hyperplastic response of the hepatic parenchyma to a developmental arterial malformation. Hence the coexistence of vascular lesion like hemangioma with FNH is not surprising. Other vascular abnormalities i.e., telangiectasis hereditary hemorrhagic telangiectasia, A-V malformations and anomalous pulmonary drainage have occasionally been reported in association with FNH. In the present case grossly there were no vascular lesions in any of the organs. However, large cavernous type of vessels were seen in the submucosa of stomach on histopathology. Liver adjacent to the nodules showed changes of chronic passive congestion. These findings further support the association of FNH and vascular malformations. In many of the reported cases, multiple FNH is more often associated with vascular malformations. However, most of these cases of multiple FNH which are reported had only 2-5 lesions in the liver. The present case had more than 30 lesions in the liver. This form with a very great number of nodules seems to be extremely rare. Thus this case highlights some unusual features of FNH which a pathologist and radiologist should be aware of to avoid making an erroneous diagnosis. 1. Farrugia P, Alaggio R, Cardella F, Tropia S, Trizzino A, Ferrara F, et al. Focal nodular hyperplasia of the liver: An unusual association with diabetes mellitus in a child and review of literature. Ital J Pediatr 2010;36:41-4. 2. Hsee LC, McCall JL, Koea JB. Focal nodular hyperplasia: What are the indications for resection? HPB (Oxford) 2005;7:298-302. 3. Colle I, Beeck BO, Hoorens A, Hautekeete M. Multiple focal nodular hyperplasia. J Gastroenterol 1998;33:904-8. 4. Bioulac Sage P, Balabaud C, Wanless IR. Diagnosis of focal nodular hyperplasia, Not so easy. Am J Surg Pathol 2001;25:1322-5. 5. Lepreux S, Laurent C, Balabaud C, Bioulac Sage. Focal nodular hyperplasia lacking some key histopathological features making the diagnosis difficult. Virchows Arch 2002;440:445-6. 6. Everson RB, Fraumeni JF. Familial glioblastoma with hepatic focal nodular hyperplasia. Cancer 1976;38:310-3. 7. Chang SK, Chung YF, Thng CH, Loo HW. Focal nodular hyperplasia presenting as acute abdomen. Singapore Med J 2005;46:90-2. 8. Scalori A, Tavani A, Gallus S, La Vecchia C, Colombo M. Risk factors for focal nodular hyperplasia of the liver: An Italian case-control study. Am J Gastroenterol 2002;97:2371-3. 9. Wanless IR, Mawdsley C, Adams R. On the pathogenesis of focal nodular hyperplasia of the liver. Hepatology 1985;5:1194-200. 10. Mathieu D, Zafrani ES, Anglade MC, Dhumeaux D. Association of focal nodular hyperplasia and hepatic hemangioma. Gastroenterology 1989;97:154-7.